French Christmas traditions often highlight France's deep-rooted Catholicism. From a special meal on Christmas Eve, to the exchange of gifts, traditions vary across different regions of France and among different families. Depending upon which region of France you're in and your religious beliefs, the holiday season starts at different times. Generally, it's one of the following. For many, the Christmas season in France begins with St. Nicholas Day on December 6th. Père Noël, or Father Christmas, visits each home. On St. Nicholas Eve, kids put their shoes near the chimney to be filled with sweet treats while they sleep. For religious families, the Christmas season begins on the first Sunday of Advent, or L'Avent. This includes the four Sundays leading up to Christmas. Christmas season lasts throughout December and carries on until Epiphany, which takes place on January 6th. The Epiphany celebration signals the end of the Christmas season and features the galette de rois, or cake of kings. This celebrates when the baby Jesus was presented to the Three Wise Men. A bean, porcelain figure, or coin is hidden inside the cake, and the person who finds it in their slice is king for the day or receives a special gift. In French fashion, holiday meals will last a long time. They will also be served on a beautifully set table and be accompanied by wine. The special Christmas meal called le Reveillon in France is most often served following the midnight mass on Christmas Eve. Expect a large meal, complete with soup or other appetizer. Popular main courses are goose and other exotic poultry, as well as seafood. Traditional Christmas dinners are followed by the Bûche de Noël, or Christmas log. 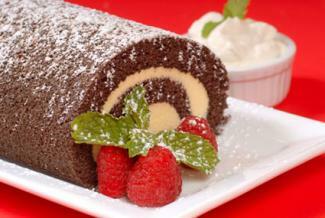 This rolled cake is often decorated to resemble a log. Traditionally, French Christmas carols consisted mainly of hymns from the church. Over time, non-religious songs have been translated from different languages into French. Mon Beau Sapin, or My Beautiful Christmas Tree, is translated from the German O Tannenbaum. From the English Jingle Bells comes Vive le vent, which translates to "long live the wind." French singer-songwriters have come up with their own Christmas songs, the most popular of these being the children's classic Petit Papa Noël. The Catholic religion shows up in many French Christmas celebrations. You'll see it in the form of decorations, events, and more. Many homes feature nativity scenes with or instead of a Christmas tree. The manger, or crèche, includes lifelike figurines that have often been passed down through generations. On Christmas Day, the youngest family member adds the baby Jesus to the scene. Families often participate in the special Advent masses leading up to Christmas, as well as in the Christmas mass itself. Children count down the days until Christmas with an advent calendar, or le calendrier de l'Avent, featuring small windows holding chocolates. The first is for forgiveness given to Adam and Eve. The second is for the faith of those God gave the promised land. The third is for the covenant with God. The fourth is for the teaching of the prophets and signals Christmas is near. While Christmas gifts are a rather new tradition in France, it is a quickly growing trend. Gifts are becoming larger and being exchanged with more people than was historically the case. Gift-giving varies widely by family in France, but it often takes place on St. Nicholas Eve or Christmas Day for kids and on New Year's Eve for adults. Perhaps the most impressive moment to walk around any French town or city in the evening is during the Christmas season. Main avenues are decked out with impressive arrays of lights, and tall Christmas trees are often decorated on main squares along these avenues. While most French families do not decorate the exterior of their homes, cities and towns do a beautiful job of making public spaces festive. The Christmas season in France is a delightful one, infused with great food and music, lighting, and decorations to lift the spirit. 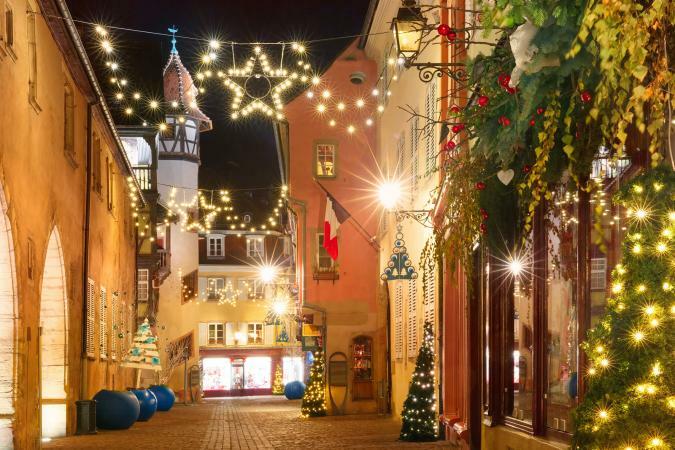 Many larger towns, especially those in the Alsace region, have Christmas markets that provide a wealth of decorations and crafts, as well as an unforgettable Christmas atmosphere.